This piece is worked by hand onto a painted background and uses a variety of stitches and threads to create a textured three dimensional effect. Stitches are layered over stitches, strips of fabric are couched to create tree bark and dyed scrim is frayed to create grass. Small scraps of machine embroidered lace have been applied for folliage. 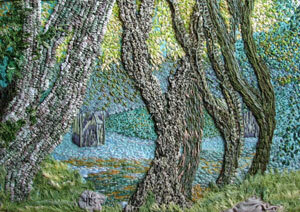 It took approximately 100 hours to work but was very enjoyable to stitch. An array of peacocks worked on a background which has been printed with a lino cut of the same image. 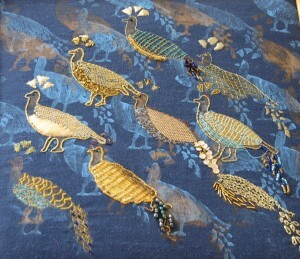 Each bird features a different goldwork technique making this technically a sampler. Mountmellick work is a traditional whitework technique which originated in Ireland. Worked with white cotton threads on heavy white cotton fabric it has a lovely textural effect and is hard wearing so great for household items such as cushions. 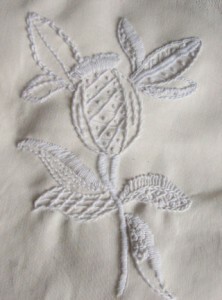 Traditional designs feature leaves, fruit and flowers and a range of stitches, some specific to this technique.